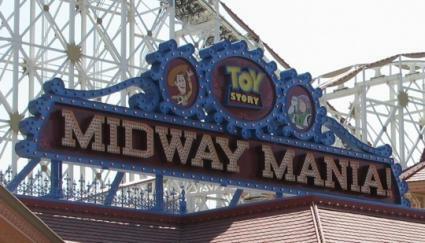 If you are planning a trip to Disneyland's California Adventure, make sure you take a spin on Toy Story Midway Mania! This 4-D attraction combines the excitement of a thrill ride with the amusement of a carnival midway. So who will guide you along your way? Woody, Mr. and Mrs. Potato Head, and other beloved characters from the Disney-Pixar movie Toy Story, of course! Toy Story (1995) and Toy Story 2 (1999) are the tales of a little boy and his toys. In the first movie, the child, Andy, receives a cool new Buzz Lightyear for his birthday. Just the presence of Bud threatens the existence of Andy's other toys, including his favorite cowboy doll, Sheriff Woody. However, when Woody and Buzz go missing (after Woody "accidentally" pushes him out of the bedroom window), the sheriff does everything he can to get both of them back home. In the end, Woody and Buzz discover the meaning of true friendship. In the movie's sequel, Toy Story 2, Woody is stolen from a yard sale by toy collector Al of Al's Toy Barn. Remembering what the cowboy did for him a few years earlier, Buzz Lightyear and a few of his toy friends (Hamm, Rex, Mr. Potato Head and Slinky Dog) set out to save Woody. However, along the way, Woody meets the rest of his original "Round-Up Gang" including Jessie, Stinky Pete and Bull's Eye. In the end, Buzz does save Woody and his new friends, and they all become fixtures in Andy's bedroom. Grab a pair of 3-D glasses and get ready for the ride of a lifetime. Toy Story Mania! is a fast-paced, interactive look into the 4-D world of a carnival midway. Each spinning ride vehicle holds four passengers (two passengers back-to-back) whose goal is to score as many points as possible with their spring-action shooters. Virtual projectiles are targeted toward the screens of each midway game. Pop balloons, break a few plates, or just get a little target practice. 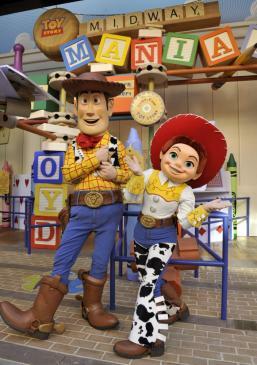 Several virtual Toy Story characters are on hand to guide you along your adventure. 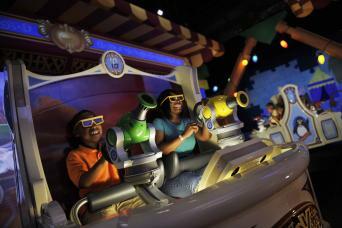 Since the ride vehicle is open in the front all the way to the floor, players of all ages and skill levels can rack up the points. You'll be in for a few surprises because several of the targets trigger some realistic responses. Nobody likes to wait in line for a ride, but at Toy Story Midway Mania!, Mr. Potato Head will definitely keep you entertained. Using the same voice (actor/comedian Don Rickles) from the Toy Story films, this Audio-Animatronics figure converses with the crowd by singing and telling jokes. Due to technological advances, he can also look at each patron in the eye while speaking. This definitely makes waiting in line a bit easier. However, since the ride only lasts about six minutes, park patrons shouldn't expect to wait more than an hour in line even on the busiest days. There are no age or height requirements to ride this attraction. Young children, however, must be able to sit up on their own and be held in place by a lap bar. No lap sitting is permitted. Guests in electric chairs or wheel chairs must be able to transfer to the ride by themselves or with the assistance of a park employee. Handheld captioning devices are available through guest relations. While FASTPASS is not an option for this ride, it does offer a Rider Switch Pass. This allows patrons with very small children to "switch" so one can ride the ride while the other adult stays with the youngsters. This was the first time that Disney created an attraction simultaneously at two different parks. Toy Story Midway Mania! opened June 17, 2008 at Disneyland Resort and on May 31, 2008 at Walt Disney World. This attraction cost $80 million to create and construct. There is an Easter egg hidden in each of the midway games that allows passengers to score additional points if they find it. You would need 5,026 toy soldiers lined up end-to-end to make up the length of the track. There are more than 150 computers communicating with each other on this ride. Mr. 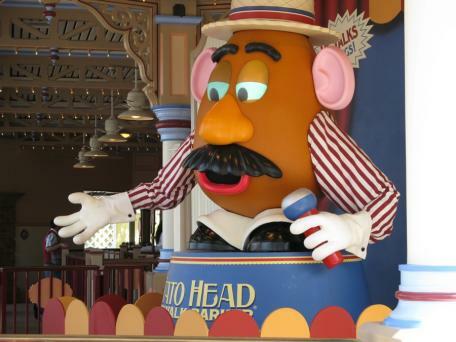 Potato Head was the first Audio-Animatronics figure whose mouth appears to form vowels and words as it speaks. The figure can also speak more lines of dialogue than any other similar figure created by Walt Disney Imagineering. It has been estimated that on any given day, patrons could break more than one million virtual plates while on this attraction. Toy Story Mania! is a fun family ride. However, if you don't like rides that spin fast, you may not want to ride this more than three times in a row (like this writer did). Take some time and visit all of the Disney-Pixar attractions at California Adventure. You won't be disappointed that you did.